Shagol gro-Bumph is an Orc farmer who resides in Aleswell. Like the rest of the town's population, he fell victim to Ancotar's inconsiderate experiments down in Fort Caractacus, and it's up to you to resolve the problem. Before the related quest, Shagol's hoe is the only visible sign that there are any inhabitants in Aleswell, as it seemingly proceeds to work the land on its own. 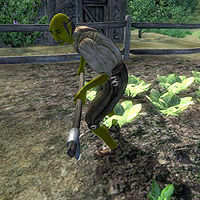 In reality, it's Shagol, busy hoeing the vegetable garden, as he will do every day between 6am and 6pm. Afterwards, he heads for a drink at the Aleswell Inn, where he spends three hours chatting with his fellow townsfolk. He goes home at 9pm for a little wandering, before he calls it a day at midnight. He wears breeches, a pair of oiled linen shoes and a shirt with suspenders. Beside his hoe, he carries around a hand scythe, a repair hammer and some gold. Like the other residents of Aleswell, Shagol has a constant Chameleon ability that causes his supposed invisibility. When you approach him for the first time (before the quest is completed and he is invisible), he will not talk to you, except for pointing you towards Diram Serethi with the words: "Talk to Diram in the inn. I'm tired of this minstrel's freakshow our town has turned into." However, once the related quest is done and everything is back to normal, he will be all over you: "Hey, you’re the one that made us visible again, right? Good show!" He will, however, forget your deed rather quickly: "Hey, do you mind not trampling on my crops? What do you want?" If asked about Ancotar, he will say, "Don't get me wrong, some of my best friends are elves, but self-important jerks like Ancotar give them all a bad name" If the quest wasn't completed successfully, he will be all but friendly: "You've got a lot of nerve, showing your face around here after what you done to us."